Imperfect barbecue is still a wonderful thing. Charlotte and Matt Gonzalez with a plate of brisket. Hours: Tue.-Thu. 11 a.m.-7 p.m.; Fri.-Sat.11 a.m.-9 p.m.; Sun. 11 a.m.-6 p.m.
Barbecue — not just Memphis and Kansas City ribs, but slowly smoked Texas brisket, the vinegar-laced minced pork of the Carolinas, Kentucky's barbecued mutton, even the tripe and trotters of St. Louis — is one of our nation's redemptive gifts to the world. Like jazz, American English, cocktails, and double-crust pie, barbecue is at once regional and universal, a symbol of melting-pot interaction, frontier ingenuity, and plain good taste. Woodsmoke, indirect heat, and the pitmaster's blend of spices and condiments add up to something infinitely greater than a simple slab of meat. When properly concocted, that is. There are three kinds of barbecue: good, really good, and mind-expanding. Like desperate, obsessive love, mind-expanding barbecue — elemental, visceral, sweet, and smoky — goes beyond mere protein sustenance or gustatory satisfaction into the realm of the sensual. Unfortunately, this level of barbecue is rarely encountered here in Northern California, where we're lucky to occasionally come upon the really good stuff. Phat Matt's, an unassuming storefront under the Shafter-MacArthur cloverleaf, makes the really good stuff. Phat Matt Gonzalez, an Oakland resident, has been barbecuing for more than three decades, first in Chicago (a barbecue destination itself), then the past few years at the Grand Lake and Metreon farmers markets, and the experience has paid off. The meats he and wife/co-owner Charlotte smoke, sauce, and serve are wonderfully rich in texture; creamy, supple and tender to the tooth; a pleasure to contemplate and consume. What keeps Matt's barbecue out of the pantheon are his salt-free rubs and ketchup-based sauces; while perfectly serviceable, even tasty, they don't insinuate themselves into the meat (and your soul) in that bell-ringing Arthur Bryant sort of way. 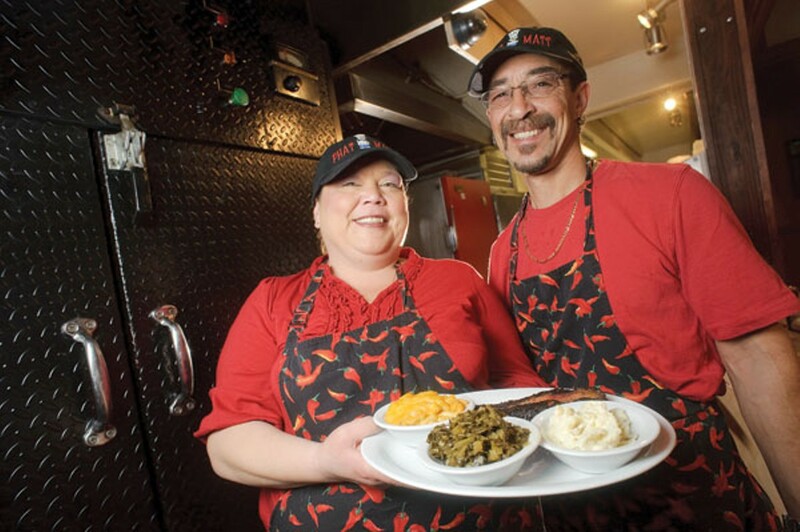 The flat, bright setting has a history of smoking and saucing, first as an Everett & Jones outlet, then as the recently departed Smokey Blues BBQ. Nowadays it's tidier and more shipshape, although the decorative trappings are still at a minimum: signed Raiders jerseys; prize ribbons from barbecue competitions; a jukebox graced with B.B. King, Jackie Wilson, and Aretha Franklin; and a long, ten-stool counter with a flat-screen TV. Floor-to-ceiling windows look out on a desolate stretch of Telegraph, and behind the cash register is the ebullient Charlotte Gonzalez along with steam tables, an open kitchen, and a smoker where the magic happens. Phat Matt cooks up a panoply of American barbecue — Texas brisket, Memphis ribs, North Carolina pulled pork — which can be ordered by the piece, the pound, the sandwich, or as a plate or combo platter with baked beans and potato salad. The brisket is the star of the menu: thick slices of fat-ribboned beef with chewy "burnt ends" (the connoisseur's raison d'etre) and meat so tender it crumbled at the touch of a fork. The ribs weren't as smoky as one might hope, but were rich and meaty all the same. Although the pulled pork wasn't entirely authentic — the North Carolina variety is more minced than pulled and has more of a vinegary kick to it — it was thoroughly irresistible, a mountain of shredded pig with charred bits, lean bits, juicy bits, and crisp bits scattered among all that creamy texture. Snappy, juicy hot links from Oakland's Prime Smoked Meats (the only menu item that isn't prepared on the premises) were the evening's spiciest dish — they left a warm, peppery afterglow in the back of the throat — but the marinated tri-tip was chewy and unexciting (Phat Matt's "hot," but not incendiary, barbecue sauce comes in handy here). The chicken-leg quarter was for the most part too pink (even red) to sample, but the pulled chicken was as dreamy as the pork: moist, supple, and richly flavored. The side dishes weren't as impressive as the big slabs of meat. An intrinsic element of the barbecue experience is crisp, palate-cleansing coleslaw, a bracing quasi-sorbet to balance out the meat's rich and fatty essence, but Phat Matt's flavorless rendition was entirely rudimentary. The mushy little collard greens, on the other hand, were not only earthy enough to stand up to the barbecue, but they had a pleasantly vinegary after-bite ideally suited to the excesses of slow-cooked pig meat. The cornbread was cold, dry, and forgettable, and the mac and cheese was served in a big wad of tepid noodles and stringy cheddar. The yams were nice and tender but almost shockingly sweet. Although the baked beans were also on the soft and sugary side, bits of smoky bacon added heft and flavor. And the potato salad was marvelous — big chunks of tender spud draped in a light, oniony mayonnaise with a tart little kick to it. There are two desserts on the menu, and they're both terrific. The pecan pie was unlike any we've tasted. In its crusade to use natural rather than processed sugars in its recipes, the kitchen substitutes brown sugar for corn syrup in the filling, resulting in a slice of pie that's closer to a big Louisiana praline than the gelatinous nut-studded goo of memory. The peach cobbler was even better, perhaps the best we've ever had: a ramekin of moist, buttery crumble crowning fruit so sweet and ripe you'd swear it was the Fourth of July. Phat Matt's isn't exactly the place to dine if you're a practicing vegetarian, although there are a few meatless (if not exactly salubrious) options on the menu: the mac and cheese, the yams, the potato salad, the coleslaw, the cornbread. Then fill up on the pie and cobbler and have a salad when you get home. Phat Matt is pursuing a wine-and-beer license as of this writing, but in the meantime customers can sip one of the menu's half-dozen soft drinks or a tall glass of freshly made iced tea, offered traditionally sweetened or sugar-free. Or head down to 25th and Telegraph and brave Kim's Backyard for a rambunctious post-meal libation. What better way to conclude an evening of good pie, B.B. King, and big platters of endemic, inclusive American cuisine?